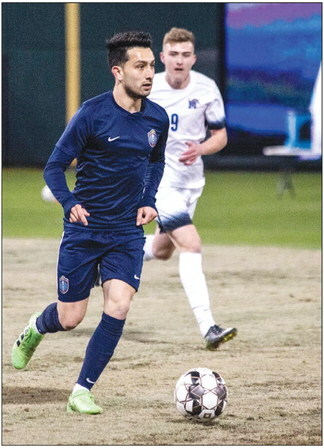 Memphis 901 FC MONTCLAIR, New Jersey – Even though they didn’t get the result they wanted, the young core of Memphis 901 FC that has been together just a little over two months took major strides Friday night. Memphis 901 FC fell 3-2 to New York Red Bulls II in the highest-scoring match in club history. Despite the loss, 901 FC head coach Tim Mulqueen was pleased with how his club competed until the very end. “I am very pleased with the effort and commitment tonight,” Mulqueen said. “I thought we competed at a very high level and scored two great goals. Memphis struck first Friday with midfielder Adam Najem tapping in a goal in the 11th minute off a beautiful setup by teammates Morgan Hackworth and Duane Muckette. Najem scored his first goal of 2019 after returning home from international duty with Afghanistan’s national team. Memphis’ lead was shortlived as New York captain Jared Stroud would even things up seven minutes later. Both teams were locked in a battle as the minutes ticked down in the first half. New York striker Tom Barlow capitalized in stoppage time to give the hosts a 2-1 halftime advantage. Red Bulls II would extend their lead in the 56th minute after sub Derrick Etienne converted from just inside the box. But 901 FC (1-2-1, 4 pts) refused to go away, fighting until the very end and embodying the city it represents. And in the 61st minute, Memphis defender and team captain Marc Burch delivered a strike off a free kick 20 yards out. The goal cut the New York lead down to just one goal. The pace picked up in the final 30 minutes of play with both teams creating chance after chance. Both clubs took a combined 16 shots in the second half as Memphis aimed to knot things up and New York looked for the dagger. Red Bulls II (2-0-1, 7 pts) had a chance to go up 4-2 in the fourth minute of stoppage time after being awarded a penalty. But Memphis goalkeeper Jeff Caldwell, who had a career-high three saves, wasn’t having any of it. Caldwell saved Barlow’s penalty kick to keep it at 32 and give Memphis one final shot until the final whistle sounded. Mulqueen said although the result did not go Memphis’ way, positives can be taken from Friday’s road match. “I think a game like this is when a team reveals its character and I think we showed tremendous character tonight,” Mulqueen said. “New York Red Bulls II has been the gold standard in our league, they won the championship in 2016. Memphis will return home Wednesday, April 10 to face Atlanta United 2 at 7 p.m. in a nationally televised match on ESPNews. Single match tickets for that match and all home matches in April are now on sale. Season tickets, group tickets, and 7 Match Flex Plans are also available, with full season tickets starting at just $10 per match. Call (901) 7216000 or go to www.memphis901fc. com/tickets for more information on all ticket options. For the latest information on Memphis 901 FC, visit www.memphis901 fc. com and follow the club on social media on Twitter, Facebook, and Instagram. About Memphis 901 FC The Memphis 901 FC franchise was announced on Jan. 8, 2018 and will begin play at AutoZone Park in Downtown Memphis as part of the USL Championship in March. Memphis 901 FC, led by Principal Owner Peter Freund, President Craig Unger, Sporting Director Andrew Bell, and head coach Tim Mulqueen, is part of a market that includes over 8,000 youth soccer players, an established American Outlaws chapter, and strong collegiate programs. About the USL The United Soccer League (USL) is the largest professional soccer organization in North America, possessing nearly a decade of experience in bringing the world’s game to communities across the United States and Canada. Overseeing the USL Championship, USL League One, and USL League Two, the organization is built on a proven and recognized model in international football and counts more than 100 clubs in its membership. Based in Tampa, Florida, the USL has grown over the past decade into a model organization with strong corporate partnerships, stable organizational leadership and a dedicated staff that provides outstanding support to member clubs and outside partners. Sanctioned by the U.S. Soccer Federation and Canadian Soccer Association, the USL is #UnitedForSoccer, moving the game forward in the United States and Canada. Adam Najeem scored an early goal for the Memphis 901 FC, but the club ultimately fell 3-2 to the New York Red Bulls II this weekend.